The most elaborate affair the Guard took part in following the war was the reception accorded President Andrew Johnson on his visit to New Haven on June 17, 1867. Former receptions to Presidents suffered by comparison. All central stores and buildings were decorated. The President arrived from Hartford accompanied by many state officials. At the station a procession was formed consisting of the Foot and Horse Guards, the Felsberg Band, the New Haven Commandery of Knights Templars, and the Marine Band of Washington, which escorted the party to City Hall. Here, in the room of the Superior Court, Governor English presented the President to Mayor Sperry. In his response the President, soon to be impeached, expressed his appreciation of the cordiality with which he had been received and said he was not unconscious of the feeling against him in some places. This he attributed to the fact that people did not know and understand him. He would have all aware that he was trying to be the President of the whole United States of America and that the public good was his only concern. In the afternoon there was a monster parade in which military organizations from the surrounding towns and from Hartford participated. At 4 o'clock the President was given a dinner at which there were many distinguished guests. The REGISTER of June 28, 1867, which printed the bill of fare, said that "the dinner was the most elaborate ever given in the state." Later the President was escorted to a steamer on which he proceeded to New York. On June 24, 1869 a battalion of the Forty-Seventh Regiment, New York National Guard, visited New Haven and the Second Company did its part in affording entertainment. Municipal officials declared a general holiday, buildings were decorated, and hundreds lined the streets to witness a parade in which all the local companies and a battalion from Russell's School took part. Before returning for home the visitors attended a strawberry festival at the Wooster Square Baptist Church. On April 11, 1870 the people of Milford heard that a fight between Jim Kerrigan of New York and jack Toughey of Williamsburg for a purse of $500 and the lightweight championship was to take place the following day on nearby Charles Island, which would bring many undesirable characters to the neighborhood. The sheriff of New Haven County was notified and he sent word to Adjutant-General Merwin. The latter obtained authority from Governor Jewell to send Second Company and other military units to the island. Arriving by special train the companies encircled the island, cutting off all means of escape, and then closed in on the law breakers. Approximately a hundred were brought back to New Haven as prisoners, among them city officials of New York and Brooklyn. Going to Hartford on October 19, 1871 Second Company celebrated with First Company the 100th anniversary of the granting of its charter. The ceremonies included the planting of a scion of the Charter Oak at the foot of Clinton Street, a review in Bushnell Park followed by a parade during the entire course of which cannons were fired and bells were rung, and an elaborate banquet at the Allyn House. 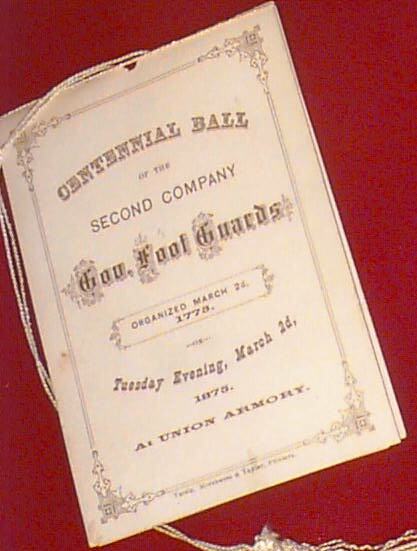 On September 4, 1872 the Second Company, Governor's Foot Guard Veteran's Association was formed, the objects of which were to be "keeping alive an interest in the Company, reviving old and pleasant memories, the perpetuation of the traditions of the Company and the cultivation of social feelings between the active members of the Battalion and the Veteran's Association." The Association made some contributions to the financial support of the Company, joined with it in its target contests and provided prizes for the winners, and assisted in arranging its anniversary celebrations and social programs. The Guard appeared in another Presidential parade in May, 1873. It was occasioned by a reunion in New Haven of the Ninth Army Corps at which President Grant, Vice-President Henry Wilson, General Sherman, General Sheridan, and other distinguished persons were present. Came the time, on March 2, 1875 when Second Company had its turn observing the 100th anniversary of its charter. It invited First Company of Hartford and other military organizations to celebrate with them. Following a parade, a review and numerous speeches a Grand Ball was held in the Armory. On July 4, 1879 New Haven observed the centennial anniversary of the valiant if unavailing defense of the city against the British invaders in which original members of the Foot Guard took a prominent part. First Company came down from Hartford. There was a flag raising on the Green at sunrise and a salute of 38 guns followed by a parade and a review. The parade was described in the REGISTER as the largest ever seen in the Elm City as it contained, in addition to the Foot Guard, numerous military units from throughout Connecticut and Massachusetts. Another huge parade was witnessed in the city on October 5, 1881 when the Providence Light Infantry came here at the invitation of members of the Second Connecticut Regiment. In the evening Second Company and the Horse Guards gave a ball to the officers and men of all the units participating in Peck's Grand Opera House.